We hope you have been enjoying our “grow your Christmas menu” series. Let’s use those strawberries you have grown! In a large bowl whisk the egg yolks and the 175g / ¾ cup sugar until thick and pale yellow. Take the vanilla pod out of the milk and cream and pour, whisking the while, the warm liquid over the yolks. Put the cleaned-out pan back on the heat with the cream, milk, egg and sugar mixture and stir the custard until it thickens, then take it off the heat and pour it into a bowl to cool. At this point you can either freeze the ice cream in an ice-cream maker, or in a plastic tub in the freezer. If you do the latter you should whip it out every hour for 3 hours as it freezes and give it a good beating, either with an electric whisk, by hand or in the processer. That gets rid of any ice crystals that form and that make the ice cream crunchy rather than smooth. Cut up strawberries, bananas and any other fruit you desire and string onto a skewer. Sprinkle some melted chocolate ontop and voila! Definitely an easy and lighter dessert option. Preheat oven to 200°C. Line a baking tray with non-stick baking paper. Cut the pastry sheet into 4 even squares. Cut each square in half to make 8 rectangles. Place the pastry pieces on the lined tray. Use a fork to prick the pastry all over. Bake in oven for 10 minutes or until puffed and golden. Set aside for 10 minutes to cool. Use a large serrated knife to split the pastry pieces in half horizontally. Spread the cut side of half the pastry pieces evenly with jam and custard. 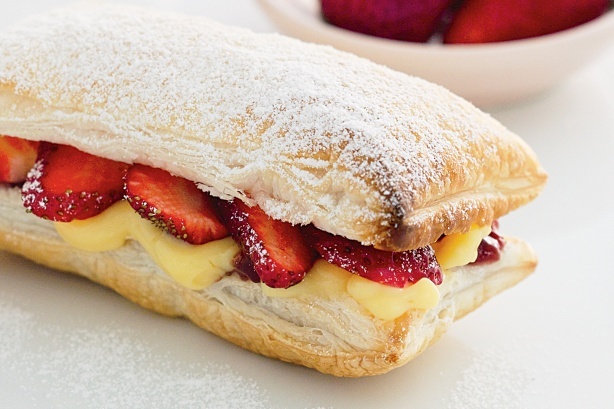 Top with strawberries and the remaining pastry pieces. Dust with icing sugar and serve immediately. And, we would not forgot the ever faithful, Aussie favourite Pavlova! Top with you fresh, home grown strawberries!